Tool to apply and calculate a surface using the Pick's Theorem. The Pick's theorem allows the calculation of the area of a polygon positioned on a normalized orthogonal grid and whose vertices are points of the grid. Team dCode likes feedback and relevant comments; to get an answer give an email (not published). It is thanks to you that dCode has the best Pick's Theorem tool. Thank you. > [News]: Discover the next version of dCode Pick's Theorem! What is the Pick Theorem? How to calculate an area with the Pick Theorem? 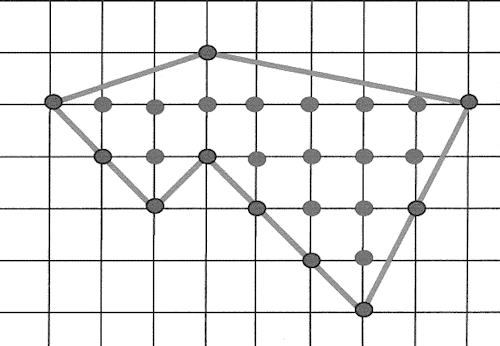 Example: The polygon drawn below has 15 points inside the polygon (light gray), and 10 vertices (dark gray). Its area is therefore \( A = 15 + 10/2 - 1 = 19 \). Improve the Pick's Theorem page!